"At the age of 14, I bought Michael his first boat. He was adamant it was what he wanted to do. He was a loveable young lad." 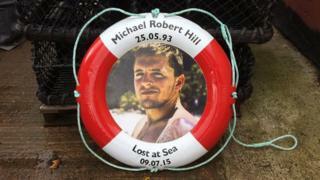 Micky Hill's son, Michael Hill, 22, was one of two young men on board a scalloper when it sank off Rame Head in Cornwall on 9 July 2015. A year later, on 6 July 2016, Michael's jawbone was found by chance on the seabed by some fishermen. Fishing remains the most dangerous peacetime occupation in the UK, with an average of 15 fishermen killed or seriously injured every year. But is the way in which the small fishing vessel industry is regulated making life even more dangerous for fishermen? Image caption The JMT was found to have been "adversely affected by structural modifications"
The vessel belonging to Mr Hill's son was found 51m (167ft) under the water the day after it sank, and the body of crewmate Shane Hooper was recovered after being spotted floating in a life ring by the crew of a yacht. Mr Hill says finding his son's jawbone gave him some form of "closure". "I keep it upstairs; it's all I have left of him," Mr Hill says. "I miss him like crazy. He was my rock. I think every day of how he died. "I had a dream before my son was born about drowning at sea. I went to see a spiritualist and she told me she knew about this dream. "She said my dream was about my son - not me." A Marine Accident Investigation Branch (MAIB) report into the sinking found the vessel's stability had been "adversely affected by structural modifications" but when Mr Hill, a fisherman, bought the boat, it had a Maritime and Coastguard Agency (MCA) safety certificate and was "all ready for sea". In regard to stability, Mr Hill says he would never have expected there to be an issue considering there was a "very recent" MCA safety certificate. "I wasn't naïve and I most certainly wasn't stupid, but somewhere along the line this boat has been allowed to go to sea, consequently with the loss of these two young men," he said. The sale of the vessel was not documented and although Mr Hill did not carry out the alterations that affected the vessel's stability, the person who did and sold it to him in an unseaworthy condition has no liability. The legal perspective - under the Merchant Shipping Act 1995 - is Mr Hill and his son were operating and managing the vessel on a day-to-day basis and were therefore responsible for its safety. Mr Hill's case is common within the industry, with written contracts a rarity and many deals completed on the shake of a hand at the quayside. There is no comprehensive, strategic or proactive policing of it by the MCA in a largely self-regulating industry. Mr Hill did not have access to the MCA report on the vessel that led to a safety certificate being issued for it. But he believes he would have had a better chance to say "hang on a minute, we have a problem with this" if he had seen the report. A jury returned a verdict of accidental death for Michael Hill and Shane Hooper - something Mr Hill still does not accept. "It was no accident. The way I see it is that two young men went to sea that day and two young men didn't come home. "It's unbelievable, really, to think a vessel gets stability criteria to say it's fine and can go to sea and yet there's things that should have been done that hadn't been done." The MCA - the body responsible for implementing maritime law and safety policy - has consistently failed to put into practice recommendations issued by the MAIB following various incidents at sea - some of them deadly. A report by the MAIB - which investigates all maritime accidents in UK waters - released in 2018 into the sinking of the Solstice gave a list of "recommendations relevant to this accident" which had been previously issued to the MCA. Specifically, the MAIB refers to recommendations - given after the sinking of the JMT, and two other vessels, the Stella Maris and the Heather Anne - which were issued in 2016, 2015 and 2013 respectively. However, maritime lawyer Andrew Oliver argues in many respects the fishing industry is self-policing, and says he can't criticise the MCA. "The fishing industry is peculiar. For fishermen, it is not a job but a way of life," he said. "Their work is ruled by the tides, the seasons and the weather and, set against that, bureaucratic rules come second. "I wouldn't say safety isn't a concern for them - none of them want to be killed or injured - but it's just another factor to take into account," he said. Mr Oliver said the MCA was "not a proactive enforcement body, it's reactive". "I cannot criticise the MCA for it - it's just what is physically possible," he added. "The MCA doesn't have the resources or physical ability to implement all MAIB recommendations - or provide a proactive service regime. "The difficulty is if you buy a vessel in good faith and don't decide to run a survey and it comes with a MCA safety certificate - isn't it reasonable for you to think it's safe? "The law says it is not, and you cannot rely on an MCA certificate." Mr Oliver said, for fishermen, safety was "not top of their things to do, there is no compulsion to do it - it gets left". "As long as you make sure the stuff you can do - so life-saving appliances are in date and used properly - you've fulfilled your obligations. "If there was a policeman on every corner, there wouldn't be as much crime. It's that sort of situation." Martyn Lane was one of four men who died when his boat, the Chelaris J, capsized and sank near Alderney in 2003. An MAIB report into the accident said problems with the stability of the vessel had not been "picked up" in safety checks before it sank. It added there was a "general lack of awareness of stability issues among fishermen" as the Chelaris J was allowed to sail, in order to "gain a financial return", despite concerns over its stability. The investigation said safety laws needed to be tightened and there should be an improved "understanding of stability, and associated hazards, among skippers and crews within the UK fishing fleet". Sixteen years on from the accident, Martyn's father, Dougal Lane - who is the former president of the Guernsey Sea Fisheries Association - says he is satisfied this has been achieved. "Recently they've changed the regulations on that. If you change any vessel now, even fitting winches, you have to have stability calculations done," he said. But when it comes to whether these calculations and checks are monitored by the MCA, Mr Lane said he "didn't know"- but that this responsibility lies with the individual. "The problem is, we produce food and food is getting cheaper and cheaper. Everybody's having to work harder and push harder. "That means more gear on small boats. You're abusing or overloading small boats. That's why most of them have gone. "But that's down to the skipper and the crew, not the MCA or MAIB," he said. He added that while fishermen do complete stability training, this "doesn't help pay the bills". "It's a business at the end of the day. "As for anyone who is producing food, whether it's farming or fishing, it's getting harder and harder to make a living." What do the MCA and MAIB say? Image caption The MCA says implementing recommendations from the MAIB is its "highest priority"
The MCA says "the loss of one life at sea is one too many and we are resolute that we will make changes to improve safety in the industry". "The fishing industry is a complex sector where it has been historically challenging to implement change. "There are MAIB recommendations still outstanding and the MCA regards it as the highest priority the recommendations are implemented. "MCA regulations, codes of practice and guidance provide a minimum standard of safety for the UK fishing fleet. However, inspections or surveys conducted by the MCA cannot guarantee a vessel will not suffer an incident. "The responsibility for ensuring individual vessels are safe to go to sea rests at all times with the owner and skipper and they must complete an annual self-certification confirming this is the case. "Owners and skippers must seek approval from the MCA of any proposed modifications prior to the work commencing. "Small vessel stability is a complex issue and the MCA has been working to develop robust proposals to enhance safety." The MAIB says it simply makes recommendations, and it is for the MCA, "as the addressee of these recommendations", to comment on the action it is taking. "Our annual reports include updates on progress being made against our recommendations," it said.